Post-transplant hypercalcemia is a major problem in renal transplant recipients, which may negatively affect both graft and patient survival. 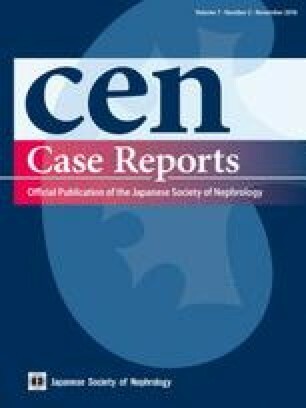 In this paper, we present a 66-year-old male kidney transplant recipient, who was admitted to our clinic with symptoms of fever, nausea, vomiting and lethargy. Laboratory data showed good renal function; however, a serum calcium level of 22.1 mg/dL. The patient was treated by isotonic saline together with furosemide and methylprednisolone. Because of treatment resistance, subcutaneous calcitonin and ibandronate were added to the treatment protocol as well. Since all these medications were not effective, hemodialysis with low-calcium (1.25 mmol/L) dialysate was applied for three consecutive days, which resulted in normalization of serum calcium. Several investigations were carried out for diagnosing the underlying etiology. Positron-emission tomography (PET)/CT revealed a strong diffuse uptake of FDG in the bones and spleen. A bone marrow biopsy showed diffuse interstitial infiltration of CD20 + neoplastic B cells and, thus, post transplant lymphoproliferative disease (PTLD) was diagnosed. Tacrolimus was switched to everolimus, mycophenolate mofetil was stopped, while treatment with R-CHOP (rituximab, cyclophosphamide, doxorubicin, vincristine, and prednisone) was initiated. Despite all therapeutic interventions, the patient died of septic shock in the intensive care unit on the 10th day of emergency service admission. Importance of hemodialysis as an emergent treatment modality in extreme hypercalcemia, and unfavorable course of PTLD were underlined. ED, CK and HY performed the collection and interpretation of the data. CK prepared the manuscript. ED, HY, SM, BS and MSS critically revised the paper. All authors read and approved the final version. Written informed consent was obtained from the patient’s parents for publication of this case report and accompanying images. A copy of the written consent may be requested for review from the corresponding author.